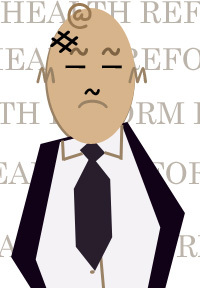 How does health reform anger affect us? Image by keito. No resemblance to any congressman intended or achieved. According to Presidential Historian Doris Kearns Goodwin, congressmen brought pistols to Congress meetings during the 1850’s anti-/pro-slavery debates and physically assaulted one another. The healthcare reform debates also resulted in what can be best described as bad behavior by members of the national legislature and public, even to the point of racial slurs. I recommend Kearns Goodwin’s interview for some interesting thoughts and perspective on just what’s going on in the USA. With healthcare reform squeaking through the United States Congress by 7 votes, American Talking Twenties readers may be wondering what effect the legislation will have on their immediate futures, since only certain aspects of the reform will begin immediately. So, will it really effect you within the year? The answer depends not only on your health, but on the state in which you’re living. Many states, including North Carolina, have High-Risk Pool insurance already. North Carolina now calls it Inclusive Health, which, according to the website by North Carolina Health Insurance Risk Pool, Inc., (NCHIRP) “provides affordable, individual health insurance for North Carolinians who buy their own health insurance and have a pre-existing medical condition, are exhausting COBRA or are eligible for HCTC benefits.” 35 states have some degree of a similar program. And it’s nothing new, either. The National Association of State Comprehensive Health Insurance Plans states that the first high-risk pools were created in 1976. The new health reform bill will set up an interim high-risk pool for the entire nation immediately. Individuals who have been without insurance for a certain amount of time, or who have been denied because of pre-existing conditions, may qualify for this national pool. You will also now be able to remain on your parents’ health insurance until you turn 27 — which, if you live in New York, are single and live at home, you can already do. 29 other states have varying laws, ranging from coverage until age 23 in Wyoming to New Jersey’s coverage until age 31 (if you are single and still a dependent, of course). One other caveat: just because you qualify doesn’t mean you won’t pay a price. When I checked out the already-existing option for myself as a resident of New York State, my premium would have been over $450 a month. If you are currently on COBRA, which allows you to continue health coverage out-of-pocket after you otherwise lose eligibility for your plan (such as by aging off of your parents’ plan, or losing a job), you will be able to keep your coverage until the insurance “Exchange” program begins. Also, under the new legislation, your insurance provider cannot drop you for reasons other than fraud. This might not seem like a big deal for most people in their twenties unless they or their parents have an expensive medical condition, such as cancer. Most twenty-somethings I know who have gone without insurance in the past, say the same thing: “I’m generally pretty healthy.” However, a 2004 analysis of data from English citizens shows cancer rates are on the rise in 20 to 24-year-olds, including testicular cancer, which affects 1 in 300 men, usually ages 20 to 35. Cancer is always the go-to example for pro-insurance arguments because it’s so prevalent, and because its seriousness is so well-understood. But there’s always the random accident factor in anybody’s life: stepping off a curb the wrong way, a glass or bottle that inexplicably shatters, or getting attacked by one of those rabid raccoons running around Central Park. Health insurance, like health reform, is a safety net for everyone. The underlying message of health reform is that insurance should not be considered a luxury. It’ll be a while before the full legislation takes effect (I heard 2014), but with what little (and imagined!) influence I have as your Editor, I want to encourage all twenty-somethings to explore the insurance options that may already be available — and affordable — to them in their home states.